Use to divert food waste, grass or yard clippings and other organic matter to composting facilities. 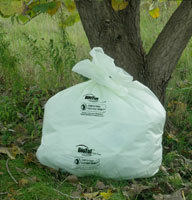 Bags will deteriorate into compost along with the contents. Use with 30 gallon cans. Liner circumference measures 60". Certified by the Biodegradable Products Institute (BPI) and meets ASTM D6400 specifications.